Music can help decrease the risk of, or prevent certain psychological conditions or mental disorders, such as depression, frustration, and even help manage anger. Music Therapy for children and teenagers with autism spectrum disorders resulted in better communication quality, reduced stress levels, enhanced social interaction, and behavior. Listening to music is generally accepted and acknowledged as having a therapeutic value since it reduces stress and anxiety levels. This is true for a wide age range of individuals - from infants to elderly adults. Music can help decrease the risk of, or prevent certain psychological conditions or mental disorders, such as depression, frustration, and even help manage anger. Thus, music therapy can be defined in simple terms as the use of music to improve the physical and mental health of an individual in a structured manner. Autism is a neurodevelopmental disorder that is characterized by social impairment, communication (both verbal and non-verbal) difficulties, and repetitive behavior. Signs of this disorder are generally observed by age 3 years, which then remain throughout the child’s life. It is very difficult for an autistic child to manage his/her life due to poor social interaction, trouble expressing themselves, and learning disabilities. Currently, the cause of autism is unknown; there is also no cure for the disorder. In 2004, a research publication in the Journal of Music Therapy, described how the use of music therapy for children and teenagers with autism spectrum disorders had resulted in better communication quality, reduced stress levels, enhanced social interaction, and behavior. Also, there was an increased attention span, coordination skill, and focus in the autistic children. The study concluded that all kinds of music interventions yielded positive results and proved to be beneficial for kids with autism. Further to this, a study by Kim, Wigram, & Gold (in the Department of Child and Adolescent Psychiatry at Seoul National University Hospital, Korea), corroborated previous studies and showed that autistic children in the 3-5 year age group expressed themselves better emotionally and also engaged socially more during the music therapy session. The treatment plans for an autism-affected child is developed based on the child’s needs. Often occupational therapy, physical therapy, and speech-language therapy are provided. Through these the children learn how to communicate effectively, relate better to others, and control their repetitive behavior. Medications are also commonly prescribed to children with autism to control behavioral and emotional problems. Trained professionals called music therapists administer individualized music therapy treatment interventions after carefully studying the affected child. The child’s behavior, physical movements, coordination, cognitive skills, etc. are observed before a treatment program is formulated. The Autism Science Foundation acknowledges that music is a potential therapeutic tool that can bring about positive outcomes in the affected children. 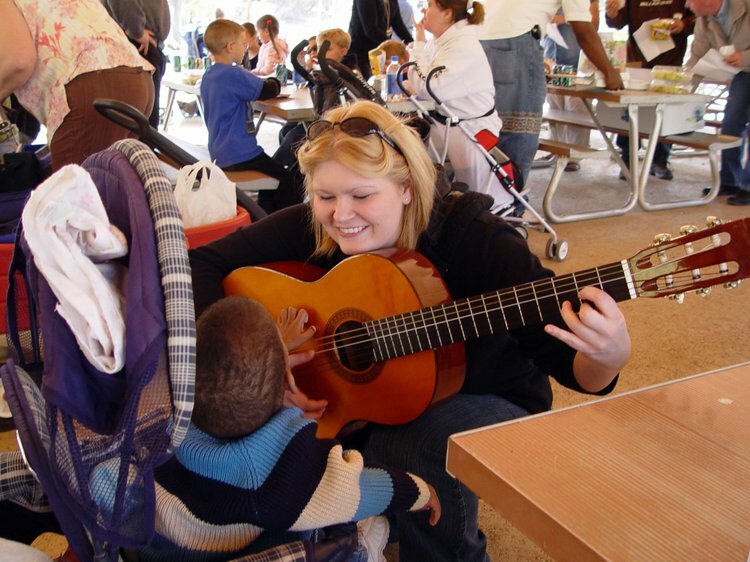 Music encourages social interactions, improves behavior and communication, and reduces stress and anxiety; besides, children seem to enjoy the music therapy sessions.it is now evident that music therapy could be a very effective treatment tool that could bridge the gap that exists between an affected child and the society. Davis, Gfeller, Thaut, (2008). An Introduction to Music Therapy Theory and Practice-Third Edition: The Music Therapy Treatment Process. Silver Spring, Maryland. pg. 475. Citro, Massimo (July 6, 2011). The Basic Code of the Universe – The Science of the Invisible in Physics, Medicine and Spirituality. Toronto, Canada: Park Street Press. ISBN 978-1594773914. Whipple, J. (2004). Music in intervention for children and adolescents with autism: A meta-analysis. Journal of music therapy, 41(2), 90-106. Kern, P., & Aldridge, D. (2006). Using embedded music therapy interventions to support outdoor play of young children with autism in an inclusive community-based child care program. Journal of Music Therapy, 43(4), 270-294. Kaplan, R. S., & Steele, A. L. (2005). An analysis of music therapy program goals and outcomes for clients with diagnoses on the autism spectrum.Journal of music therapy, 42(1), 2-19. Boso, M., Emanuele, E., Minazzi, V., Abbamonte, M., & Politi, P. (2007). Effect of long-term interactive music therapy on behavior profile and musical skills in young adults with severe autism. The Journal of Alternative and Complementary Medicine, 13(7), 709-712. Accordino, R., Comer, R., & Heller, W. B. (2007). Searching for music's potential: A critical examination of research on music therapy with individuals with autism. Research in Autism Spectrum Disorders, 1(1), 101-115.